Renters vs. Homeowners at the Ballot Box — Will America’s Politicians Represent the Voice of Renters? Renter voices are underrepresented in American politics. Renters are less likely than homeowners to be voting eligible, and even among eligible voters, just 49% of renters cast a ballot in 2016, compared to 67% of homeowners. Renters are significantly more likely to lean left. Among homeowners, President Trump beat Hillary Clinton in the 2016 election by a margin of 6 percentage points, but Clinton won the renter vote by a staggering 30 percentage points. We estimate that if renter voter turnout had matched homeowner voter turnout in 2016, Hillary Clinton would have won four key swing states — FL, MI, PA, and WI — leading to an electoral college victory of 307-231. 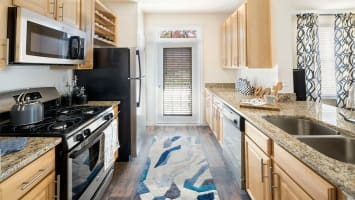 Renters represent a unique cross-section of the American population — the net worth of the median renter is just $5,200, compared to $231,400 for the median homeowner, and the minority share of renters is twice that of homeowners. A coalition of renters could swing elections for politicians offering a vision of inclusive economic hope for the millions of diverse renters struggling in today’s economy. Congressional midterm elections are just a week away, and their outcomes will significantly impact the ability of the Trump administration to implement its agenda in the years to come. Although Democrats are currently projected to win the House and Republicans are expected to retain control of the Senate, these outcomes are far from certain. Actual results will depend heavily on voter turnout among various segments of the U.S. population. 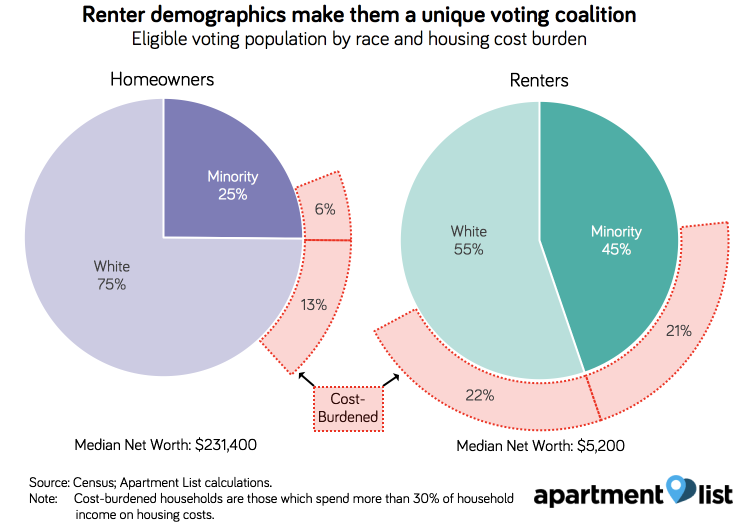 Renters are not conventionally considered a distinct voting coalition, yet they represent almost one in three voters, or 30.2 percent of the eligible voting population, and they face a distinct set of economic challenges. Small changes in turnout amongst renters can have a profound impact on national politics. We estimate that if renter voter turnout had matched homeowner turnout in the 2016 presidential election, Hillary Clinton would have won four key swing states — Florida, Michigan, Pennsylvania and Wisconsin — which would have secured her the presidency. Only 29 percent of those living in renter-occupied housing voted in the 2016 elections, compared to 52 percent of those living in owner-occupied housing. The factors influencing trends in renter voting fall into two broad categories. The first is demographics; a larger share of the renter population is simply ineligible to vote. An estimated 60 percent of renters are voting-age citizens, versus 77 percent of homeowners. The second is that renters are less politically engaged than homeowners; an estimated 67 percent of eligible homeowners voted in 2016, compared to just 49 percent of eligible renters. This disparity in political activity is at least partly attributable to the fact that homeowners have a large financial interest in policies that could affect local property values, creating an additional incentive to vote that is not present for renters. Although this incentive for voting comes from the local level, its impact ripples through to national politics. That said, even among individuals with an equal propensity to vote, actually doing so may be harder for renters. Renters move more frequently, which means that they must often undertake additional efforts to maintain an active voter registration. Furthermore, renters are more likely to work hourly wage jobs, and voting may require taking time off work that impacts their paychecks in a way that salaried workers need not worry about.1 Finally, renters are more likely than homeowners to be members of minority groups that may be subject to voter suppression tactics. The governor’s race in Georgia is currently plagued by accusations of voter suppression, with the Associated Press finding that 70 percent of the 53,000 pending voter registration applications in question are from black Georgians, and according to data from Census, 53 percent of black Georgians are renters. 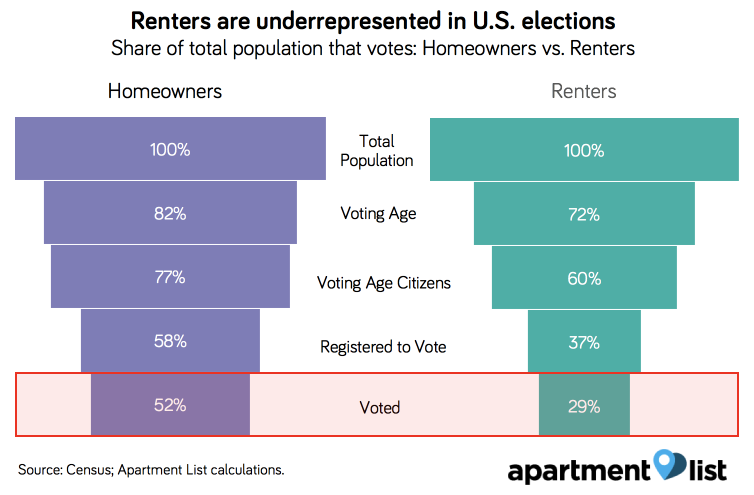 The fact that renters are underrepresented in American politics is particularly important because renters have voting profiles that are highly distinct from that of homeowners. Using survey data from American National Election Studies, we find that in 2016, renters were significantly more likely to vote for Democrats in presidential and congressional races. We estimate that among homeowners, President Trump beat Hillary Clinton in the 2016 election by a margin of 6 percentage points, but that Clinton won the renter vote by a staggering 30 percentage points. This is larger than the margin by which Clinton won millennial voters, a coalition that Democrats have made substantial efforts to court. We find similar disparities in homeowner and renter voting patterns in the results for congressional races across the Senate and the House of Representatives. Importantly, this result is not driven by the geographic distribution of renters. Even in states that President Trump won by a margin of more than 10 percentage points, renters voted for Clinton by a margin of 9 percentage points. Because of the distinct voting profile of renters and their large population share, increasing voter turnout among renters could have a significant impact on national elections. We estimate that if turnout amongst voting-eligible renters had matched homeowner turnout in 2016, Hillary Clinton would have won four key swing states — Florida, Michigan, Pennsylvania, and Wisconsin — leading to an electoral college victory of 307-231. If only renters had voted, Donald Trump would have won just five states with a total of 23 electoral college votes. Renters could also have had an impact on the makeup of the current 115th Congress. In the House of Representatives, we estimate that Democrats would have won between two and five additional seats if renter turnout had matched homeowner turnout. If only renters had voted, Democrats would have won more than two-thirds of the seats in the House of Representatives. We estimate that Democrats may have won the Senate race in Pennsylvania if renter turnout had matched homeowner turnout. Although this still would have left Republicans with a Senate majority, this seat could have been pivotal in the numerous contentious battles that have played out in Congress over the past two years. If only renters had voted, Democrats would have won more than three-in-four of the Senate seats that were up for reelection in 2016. The major political parties make significant efforts to court the votes of various demographic groups, such as Latinos, millennials and the working class. While renters are seldom considered a voting coalition, they make up nearly one-third of the eligible voting population, have the significant potential to swing elections, and represent a unique cross-section of the American population. 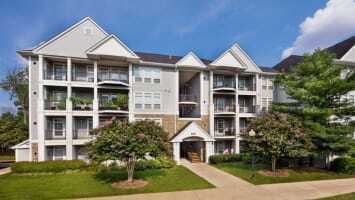 Perhaps most importantly, renters face a distinct set of economic challenges. The net worth of the median homeowner is $231,400, more than 44 times that of the median renter, who has a net worth of just $5,200. Renters are also far more likely than homeowners to be spending an excessive share of their income on housing costs, a problem that affects low-income renters in both urban and rural communities. Senators Kamala Harris (D-CA) and Elizabeth Warren (D-MA) have both recently introduced ambitious pieces of legislation aimed at improving housing affordability, proving that the economic concerns of renters are increasingly at the forefront of American political discourse. Low-income renters have many of the same economic concerns as the white working-class voters that make up a large share of President Trump’s base. However, renters are significantly more racially diverse than homeowners, so a successful renter platform would also need to encompass the concerns of minority populations. The Census projects that the U.S. will be “minority white” by 2045, meaning that, at least in terms of racial composition, the renter population resembles the future of the country far more closely than the homeowner population. Next week’s elections will turn on which party has done a better job of presenting a vision of the country that inspires voters to show up at the polls. In their efforts to court Latino voters, Democrats have focused on highlighting their opposition to the Trump administration’s immigration policies, but there are signs that this strategy may prove ineffective, as economic desperation and a lack of faith in politicians of either party have left many Latino voters feeling disempowered and apathetic. Perhaps these voters could be better motivated by a platform offering a vision of inclusive economic hope for the millions of renters struggling in today’s economy. While this analysis focuses on national elections, it is equally important for renters to have their voices heard in local politics. The incentives that boost political activity among homeowners occur largely at the local level, and the effect of homeownership on voting is largest in elections where zoning issues are at play. The homeowner’s financial stake in local property values creates a preference for limiting the supply of new housing, and the restrictive zoning policies that result have contributed significantly to the country’s current affordability crisis, much to the detriment of renters. 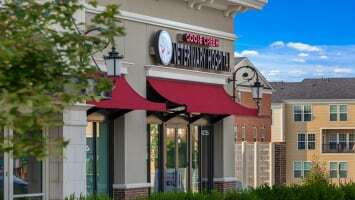 As the high-paying knowledge jobs of the modern economy continue to cluster in a relatively small set of “superstar cities,” the question of how to maintain inclusiveness and access to opportunity in these places looms large. These issues are beginning to take on a more central role. In California, the ambitious zoning bill SB 827 was the subject of national attention earlier this year, and a statewide rent-control proposition on next week’s ballot is being closely watched. While national elections get the most attention, many of the choices that shape the ways in which we allow our cities to grow and evolve are made at the local level. It is therefore crucial that renters pay attention to local elections and make their voices heard on these issues. Renters are underrepresented in American politics in a way that has serious implications on the local and national stages. We show that renters would have swung the 2016 presidential election if they had shown up to the polls at a rate equal to that of homeowners. Renters are also a diverse cross-section of the population with distinct economic needs, and thinking of them as a voting coalition would represent a significant shift in thinking that could help shape the platforms of the nation’s major political parties. The potential impact of changes in voter turnout among renters serves as yet another reminder of the importance of voting, and Apartment List encourages all Americans to vote, regardless of homeownership status. 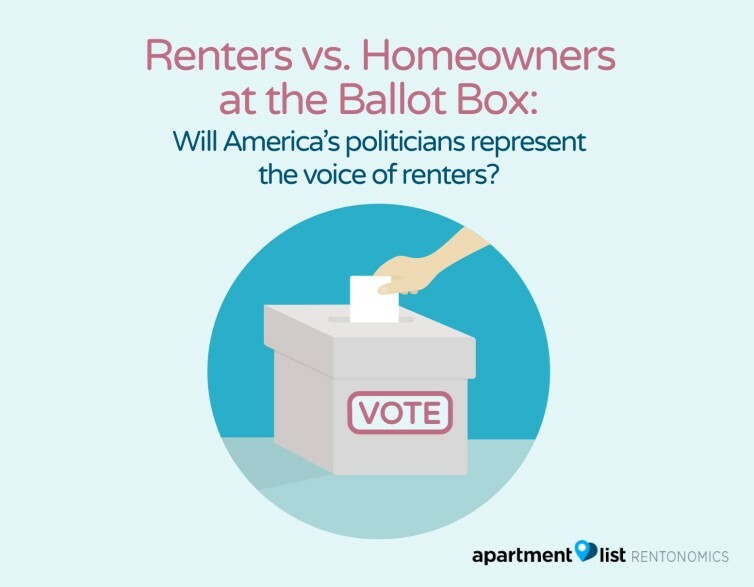 We would also like to pose a question to our nation’s elected officials — which of you will represent the voice of America’s renters? Based on data from the Census Current Population Survey, we estimate that 65 percent of employed renters are paid hourly, compared to 54 percent of employed homeowners.